Christine DeRosa/Contributing Photographer Graduate student guard J.C. Show put up only three field goals and 12 points in an offensively sluggish performance by Binghamton against NJIT. Just over a minute into Friday night’s game, a dunk by sophomore guard Albert Odero gave the Binghamton men’s basketball team a 2-0 lead. The fans in attendance were cheering, optimistic for an exciting follow-up performance to the strong offensive showing in the opener against Cornell. But, unfortunately for Binghamton, this proved to be its only lead of the game. The Bearcats (0-2) struggled offensively in a 74-57 loss to the New Jersey Institute of Technology. Despite the emphasis on a defensive lineup, Binghamton struggled to contain the Highlanders (3-0). Senior guard Diandre Wilson led NJIT with 21 points, including making eight of 14 field goals in just 24 minutes played. The Bearcats’ key defensive player, senior forward Thomas Bruce, remains sidelined while in concussion protocol. 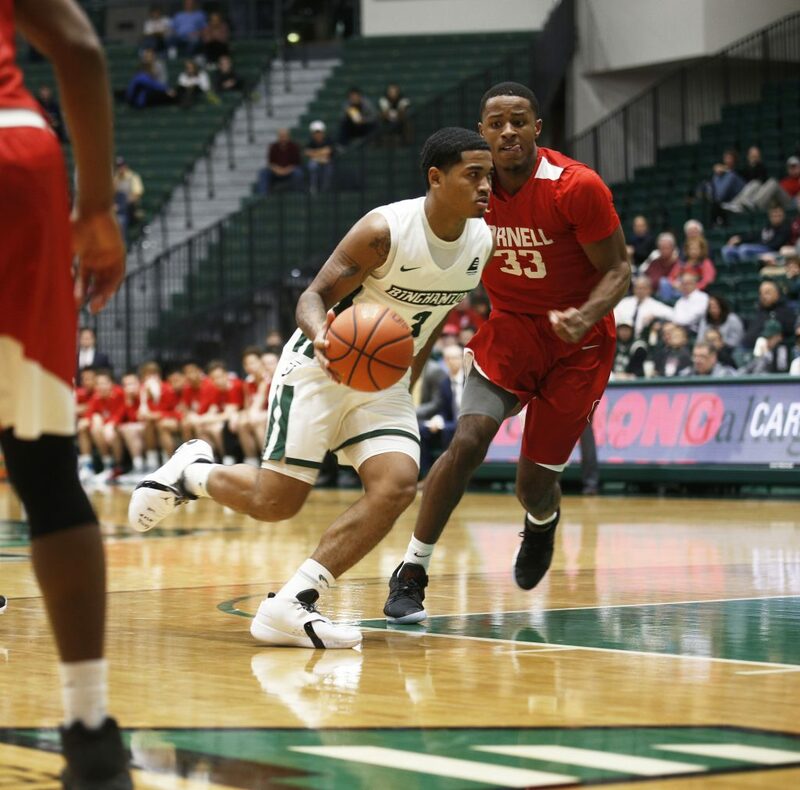 Also without sophomore forward Tyler Stewart, the patchwork lineup put out by Binghamton proved to be not enough to outperform NJIT. Earlier in the week, freshman guard Sam Sessoms dominated against Cornell, scoring 27 points in his collegiate debut. But the Highlanders took notice, game-planning defensively and holding him to just 13 points in the game. While a far cry from his previous performance, it was still high enough to lead the team in scoring. Show finished the game with 12 points, good enough for second on the team, and one of only two double-digit scorers for the Bearcats. After scoring just 20 points in the first half, Binghamton improved marginally in the second, scoring 37. Overall, the Bearcats shot only 31.6 percent on field goals and were five for 18 from the three-point line, including making just one of eight attempts in the second half. There is work to be done, and the team knows it. Despite the end result, it wasn’t all negative for BU fans. A heartwarming moment for local high school basketball supporters occurred when freshman guard Leo Gallagher made his collegiate debut, entering the game with just over two minutes to go. Gallagher, a Binghamton native, had an illustrious career at Seton Catholic Central High School in which he led the Saints to the state championship game during his senior year and earned a First Team All-State selection. Gallagher finished the game with two points converting on a layup. Despite a difficult start, the Bearcats have an excellent opportunity to regroup and rebound as they close out their opening three-game homestand with a matchup against Division III Misericordia. Dempsey knows that it’s been a struggle, but he plans to move on and put the team’s focus forward for the duration of the season. Tipoff against Misericordia is set for 7 p.m. on Monday, Nov. 12 from the Events Center in Vestal, New York.